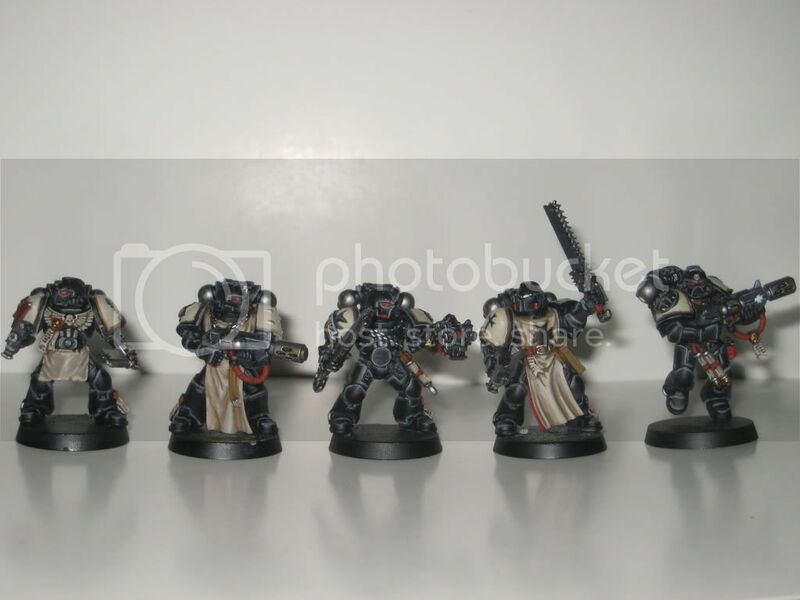 Here are my first 5 Templars, C&C welcome. Also my first stab at taking halfway decent mini photos, so pointers welcome there too! 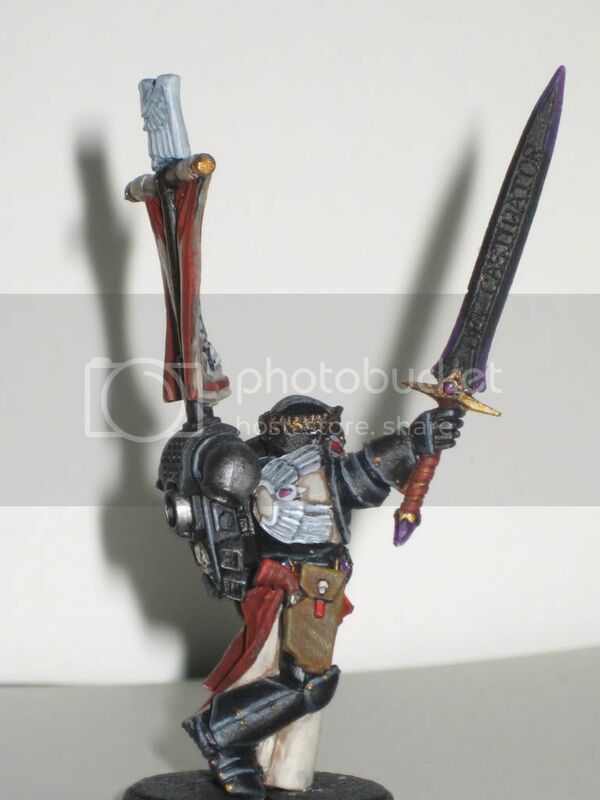 The guy without any base work done was my prototype, hence the brighter highlights. Still trying to figure out a simple way to dull those back down to Codex Gray. Also my first attempt at basing, and it didn't go particularly well IMO. Gonna scrape em off and try again sometime down the road. Edited by Firepower, 10 February 2018 - 12:54 AM. Suffer not the xeno psyker kitten, as to it the souls of man are but balls of yarn and jingly amusements! Brother Chaplain Kage: "I don't think anything makes Firepower happy." They look great, Firpower. Well done! W/D/L? Pfft. Games Enjoyed/Disliked: 12/0. 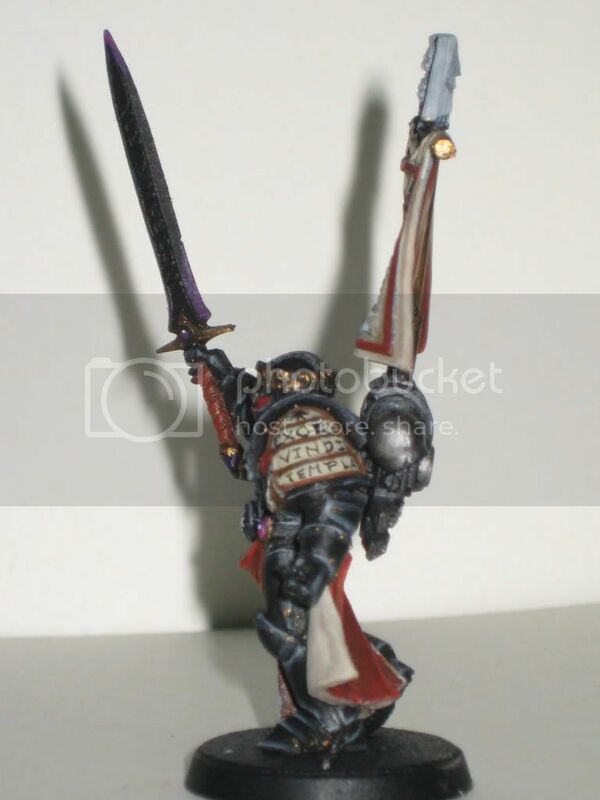 My 40K and some WHFB BLOG! Excellent start. Keep it up. I love the use of brown as a base color for our white sections. It really adds some depth and grit to the white. 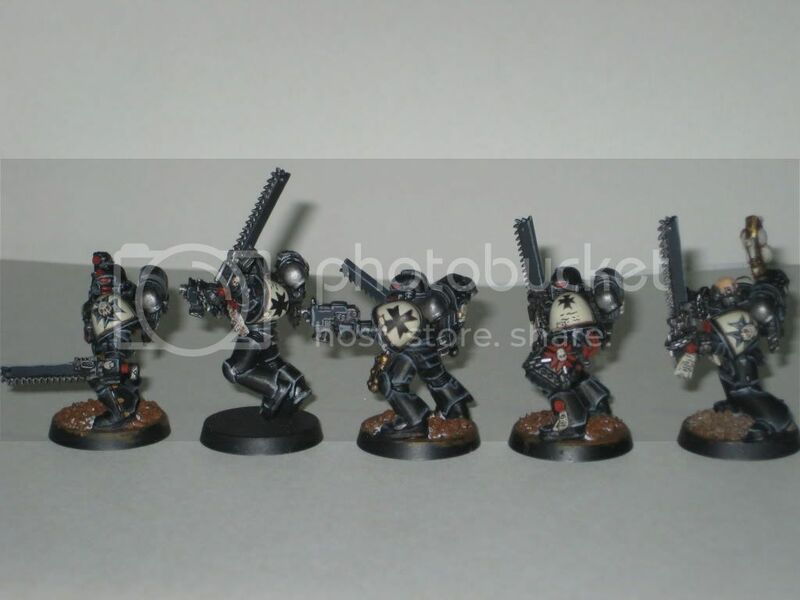 My thoughts on 40k: http://gonetoground2.blogspot.com/. Did you draw the crosses yourself? They are magnifisent! Pain is an Illusion of Senses. Despair is an Illusion of the Mind. Wow, that was a fast bunch of responses. Well, thanks all for the support and compliments! Kinda surprised that the shoulder pads seem to be stealing the show, considering how much i cheated on em. That off white (bleached bone) i chose was because i can't ever get an even coat of pure white. The varying designs on the hand painted crosses are due to the fact i can't successfully paint a uniform shape over and over. Still though, i guess you wouldn't guess that from looking, eh? Again, thanks for the support and thanks to those who's own models inspired me to whip up these fellas . As of now i have 5 more Templars sitting on my bench, but currently my Emperor's Champion takes priority, a la Oath Completion. I'll try to hurry him along a bit so i can just attach him to this post instead of starting a whole new one weeks from now. Also got some old scout models to tinker with and figure out an appropriate Neophyte color scheme to match with their big brothers. Well, the shoulder pads are really catchy. Edited by Smirnov, 02 April 2010 - 10:43 AM. You've done some damned fine painting right there, Brother. 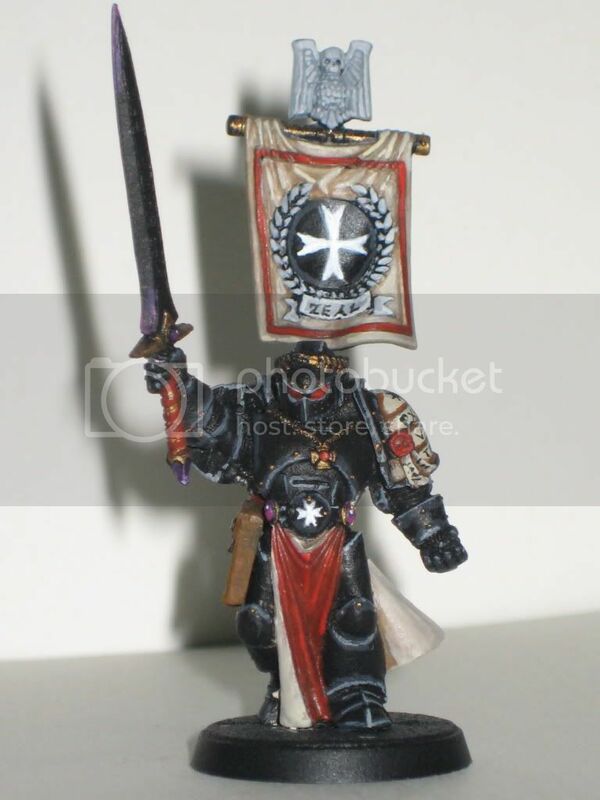 The Black Templar lend themselves to personalization in ways that most other Chapters don't even dream of: Fighting companies, crusades, the gothic knight theme as a whole. Different is better! 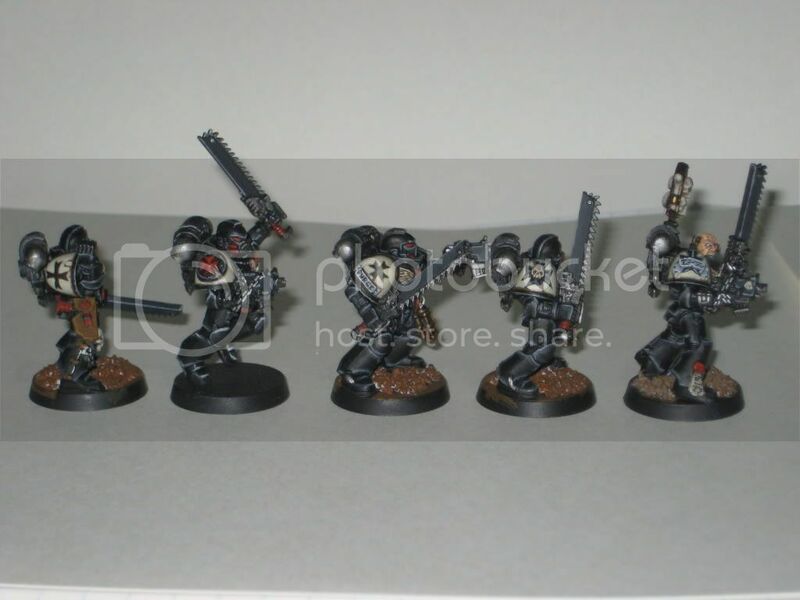 As long as the customizations follow the same theme and general color use (and everyone is still a *Black* Templar!) 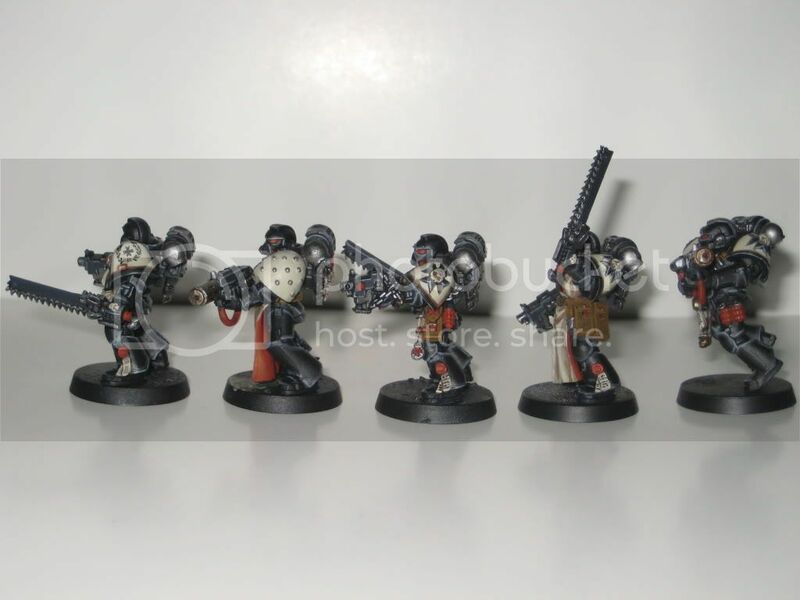 not only will you be able to show off your painting talent, but you will have a wicked, wicked Fighting Company. Those are very nice indeed. Very clean, good stuff. With basing I like to glue the flock (or sand) to the base before undercoating and seal it on with a layer of black paint, then I undercoat the model. The first thing I'll paint is the top of the base as I can be as sloppy as I like with drybrushing and I won't ruin any paint job on the legs. Once the base is done I'll cover up any splashes on the legs with black paint and start the model itself. I do the sides of the base at the end. I started doing this mainly for convenience, but I've found that I prefer painting a black model on a finished base as it allows me to see the model in a proper context and it's easier to judge how far to take highlights on the armour. Agreed! The crosses look good. Lovely, not too busy good colours. What did you use for the highlights? 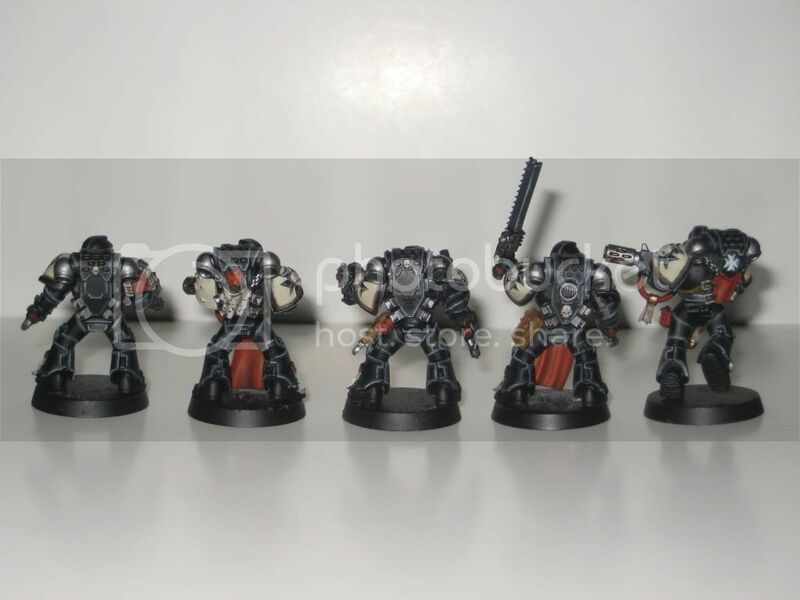 Highlights for the black armor? First a semi-sloppy highlight of roughly 50:50 Chaos black and codex grey (not exact measurements, just had to eyeball it til i got the shade i wanted). Second a very fine highlight of codex grey. Keep the brush fairly wet and take your time or else it ruins the blending- if you go without watering it down or lay it on too thick at once it's just as bright as Fortress grey. Simple and straightforward but still a bit time consuming. The one big advantage is that the 50:50 mix doesnt show up particularly well in average room lighting, so it does it's job as a blender for the highlight but you dont have to be very precise at all. The big disadvantage is that it shows up even worse when the paint is still wet, so you'll have a hard time seeing just what you're doing. If it gets too out of hand, all you have to do is clean it up by pushing it towards the borders with more basic black afterward. As for the notes about personalization on shoulder heraldry, yeah i was counting on that loophole . The shoulders take the most time of any part of the model, and i even paint them separately before attaching just to make sure i can give them proper attention. Since I cant make a perfectly identical cross over and over (or even twice in a row) I decided to have a little fun with it and try to make each one unique in its own right. Plus mixing in a standard BT plastic shoulder on each model keeps it feeling uniform at the same time. Sometime down to road I might even go back and start adding white scripture on the armor like most folks tend to do, but for the moment I'd like to actually get a fieldable army painted for once . Tried to make the left shoulder pad look segmented, not sure i like how it came out though . Also, left the sword as base black as possible to keep in line with fluff, but felt a teeny bit of purple reflection here and there couldn't hurt. And it's probably pretty apparent I'm still fiddling with mini photography. All in all though, I'm feeling pretty happy with the whole thing. Now i just gotta base the lil bugger to fulfill my Oath (couldnt wait til tomorrow to post it and show off ). 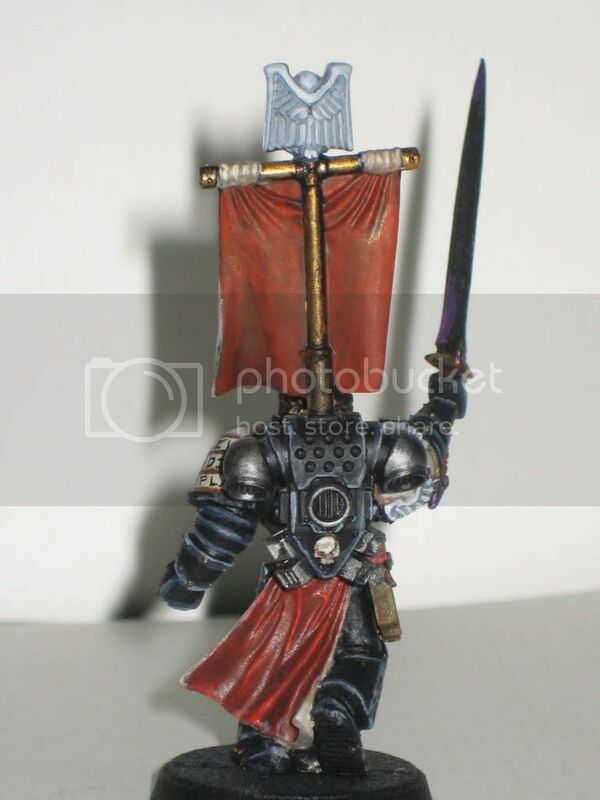 I would go nuts and paint the sword like black marble. Love the initiates very nice job. 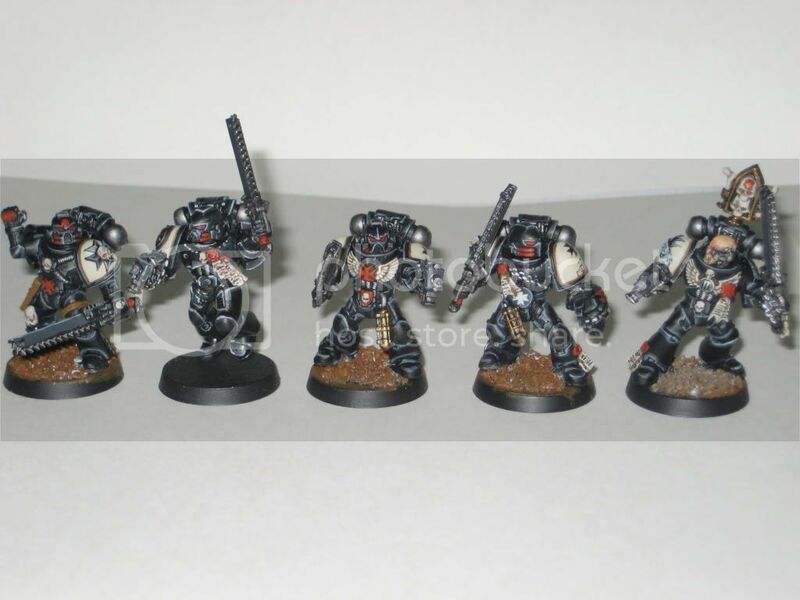 EC looks good, just think that metal figs dont look as clean as the plastics. MY EC had that rough look too. Still great paint job. I like your EC, especially the banner work. Was that all free hand or is that one of those pre-made banners? Either way, looks good. I like the time you took to paint the rivets as well. What kind of look are you planning on using for your basing? Everything look great so far! Thanks for sharing, we are all looking forward to seeing more!! 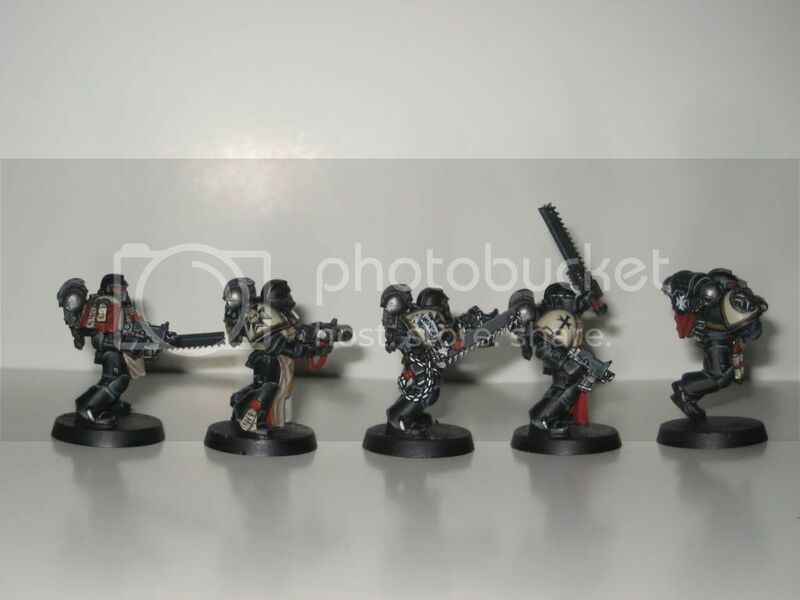 Took me a while, but here are 5 more Brothers ready for the front! Now it's a toss up between working on a rhino, or figuring out a scheme for my Neophytes. Not particularly fond of either option . I like them, but are you gonna base 'em? And the rhino allows for a lot of customization if you do that, but neophytes are interesting too if done right. I've taken a few shots at basing and it hasnt gone well. More often than not the basing is incredibly brittle and flimsy, flaking off with pressure as light as a heavy drybrushing. I still have a few other methods to try out (using more glue, different mixes of materials, etc.) but frankly i find it tedious. As for the rhino, i just dont care for painting armor much, which is a real bane in 5th edition apparently . I've been dreading working on the Neo's because of figuring out a new paint scheme, but a quick test run earlier tonight actually proved pretty solid and very easy, so they'll be up next. Hey Firepower, great templars. Loving the shoulders as has been previously mentioned. On basing you said you sealed the sand with the black primer, try watered down PVA. Make sure it has lots of time to dry (24hrs to be sure I spose) and then you can go nuts with drybrushing! Tonight , the world is ours !